Day 1: Buck Mulligan’s Day Off…or Why John Hughes Should Have Made a Movie From this Stuff. Hey Dedalus...let's skip school and cruise around Dublin in your Dad's new Model T! 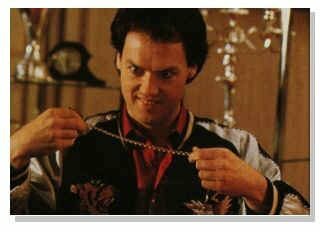 Wait...Stephen...We don't have to go to a brothel tonight...we can open our own brothel in Sandycove Tower!!!! There’s nothing worse than a roommate who is so cool you can’t stand him. It’s even worse when you owe him money. The thing is, guys like Mulligan are hard to hate, no matter how much they annoy you. 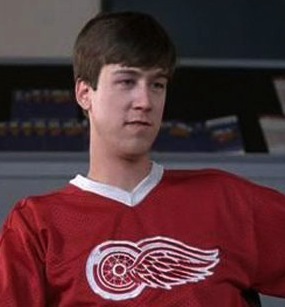 that I could totally see Alan Ruck playing him in the movie (if it were done back in the 1980’s). 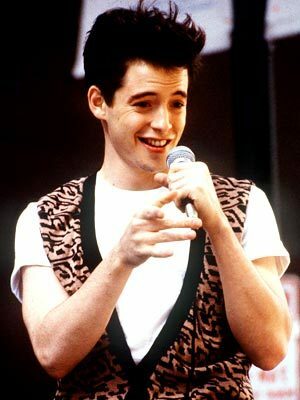 There’s a school of thought that says all of “Ferris Bueller’s Day Off” is actually a delusion that exists inside Cameron’s head. Getting inside Stephen Dedalus’ head is definitely not nearly as fun. At one point he seems to be reminiscing about visiting Paris, only it’s like he drank so much absinthe that he can’t remember the good parts. We get some hints at the fun stuff, but mostly it’s just little scraps of French mixed in with images of a girl. Come to think of it, that’s about all I remember from my first trip there. I guess I shouldn’t complain. One of the things that has kept my attention focused on the book is trying to find all the sub-references that Joyce likes to scatter about the narrative. For example, when the locals talk about a body washed out to sea and someone says “five fathoms”, I know it’s a reference to the Tempest…and several pages later Stephen thinks about the same passage: “Full fathoms five thy father lies”. Stephen has daddy issues. But at the moment it’s his mother that is plaguing him…specifically her death. Mulligan seems to take exception to the fact that Stephen refused to pray at his mother’s deathbed, even if it was just to humor her. Steven’s douchey roommate is pretty much a pragmatist at heart. He’d rather that Stephen fake it a little to ease his mother’s suffering rather than stick to a principle no matter how hard it might be. What makes Mulligan even more douchey is that he likes to berate Stephen even after it’s too late to do anything about it. It never occurs to Mulligan that Stephen is still haunted (literally, in his dreams) by his mother’s passing. To make matters worse, Mulligan has invited a boring Englishman named Haines to stay at the tower. He then asks Stephen for a loan and the key to their domicile. This is so like having a bad roommate it’s not even funny. Dude invites someone to crash on the sofa, then asks you for some cash and the key to the flat. No wonder Stephen elects not to go home that night. Author, Poet, and fan of all things geek. This entry was posted in English Literature, James Joyce, Ulysses, Uncategorized and tagged Bloomsday, English, English Literature, Irish Literature, James Joyce, Leopold Bloom, Novels, Stephe Dedalus, Ulysses. Bookmark the permalink.